There are many things in life that confuse the hell out of me. 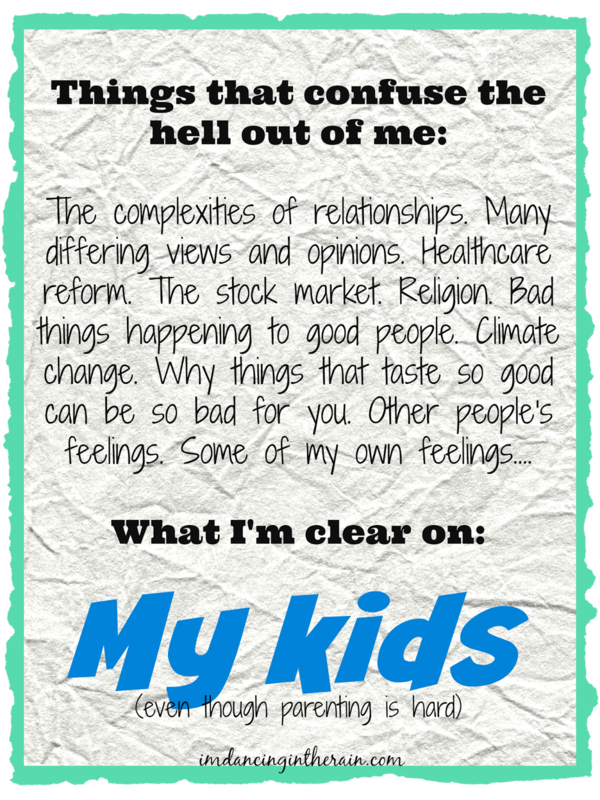 The one thing I seem to have clarity on is my kids. Or is it that being a mom gives me clarity? I don't know if it's maternal instinct, knowing them since before they born or angels whispering in my ear (or a combination), but it just IS. Like when I have to talk to them about something. Even the most tough things like about their dad's health problems, I seem to always find the right words. This was made evident to me in March 2012 when Mark was so sick in the hospital with arrhythmia. I was terrified and dreaded talking to Camryn and AJ about what was going on. When I did, it just clicked. Even when Camryn asked the worst question of all -- could her dad die -- the words came. And I didn't ball in front of them. I was stronger for them than I ever thought I could be. When it comes to their moods, I can tell when they're off. Whether they're just tired, or something happened that made them feel something. I know. Getting them to share it with me is another story. But I know. Camryn is 14 and a freshman in high school. Her hormones are running wild, and her moods are along for the ride. Sometimes she is inexplicably crabby (heck, sometimes we all are). But in the days following the MPHS shooting, she was especially quiet, and when not quite, very irritable. At first I wasn't sure what her problem was because I really couldn't tell if the shooting had sunken in for her. Camryn can be a tough nut to crack. Whenever I'd ask her what was wrong, she'd say "nothing" or "I don't know". Finally (FINALLY) she said, "Well, I've been like this ever since the stupid shooting, so maybe it has something to do with that!" She went on to say something along the lines of "parents just don't understand" and she specifically said, "Only my friends and my music get me." There are a lot of things from my childhood that I don't remember, but I can totally recall being a teenage girl. So the funny thing about my daughter saying I don't get it is....I actually DO get it. Something else I get, though, is that she won't get that I got it until she has kids of her own. Sigh. Then there's my son. Sometimes AJ will come stomping into the house after being out playing with friends. He is obviously bothered by something, but when asked, he says he's fine. Dude, you can't fool me, I'm your mother. But he has this pride, this major ego thing of his that tells him he doesn't need to talk about it. Like a typical male, he just wants to stew, and make the rest of us miserable, until he gets over it. Being a mom (and not male), I want him to talk to me about what's bothering him. I respect his inherent maleness -- for awhile -- but because I don't want him to grow up to be the kind of man who is unable to express his feelings (assuming his future wife will thank me), I prod him until he gives me something. Yeah well, I say it's the kids who don't understand. They have no clue how much we love them and how well we do know them. And, dare I say it, that we can even relate to them. I told my daughter not to underestimate her dad and I. She said she'd try.